Student credit card debt has become a real problem in the US over the last several years and even provisions in the Credit act of 2009 designed to decrease it have been less than effective. According to a survey conducted by Sallie Mae in 2010 US college seniors graduated with an average credit card debt of more than $4,100, almost double the figure in 2004. In addition a fifth of those graduating seniors were heading out into the world with over $7,000 in credit card debt, to which you can only say “ouch”. The problem is that in today’s world if you want to get a car loan or qualify for a mortgage, which most young people do want to do after college you need a good credit history and a good credit score. And often the only way to build such a history is by using a credit card the right way. So to outright say that parents should forbid their teen from ever even thinking about getting a credit card is unrealistic in this day and age. So instead parents should focus on teaching teens the right way to manage a credit card and perhaps to be most effective that education should begin early. 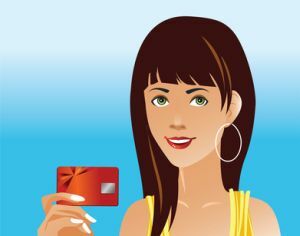 Many of the traditional pre paid credit cards that are available today are only available to people over the age of 18. However there are a growing number of prepaid cards that are aimed directly at the 13-18 year old set that are administered and funded by parents but give teens the freedom to actually have a credit card in their wallets (which looks so cool at McDonald’s ask any teen…) But these prepaid cards actually do more than that as they can serve as a great teaching tool. Mom and Dad load the card with a certain amount of money. Then both the teen cardholders and their parents can track spending on-line and when a teen has spent their way through all the money thats it- they can spend no more. The other nice feature about these prepaid teen credit cards is that if the teen has a job and their employer offers direct deposit – which most of them do these days – they can choose to have their paycheck directly deposited to the prepaid credit card – avoiding the hassle of trying to cash their check, which can be a problem for a sixteen or seventeen year old who does not have a drivers license yet. If you do want to get one of these teen prepaid credit cards for your child shop around. Some of them charge quite high “load fees” in addition to the usual ATM fees etc. Two very good teen prepaid credit cards are the Bill My Parents Prepaid MasterCard – which has very low fees all around and the American express Pass which actually even offers some things that “real” credit cards do including purchase protection and roadside assistance services. A decade ago parents would give their kids a card in their own name that was an additional card on their own credit card and it did help teens over the age of 18 build credit, especially if that card was an American Express charge card. That is no longer the case however, credit is all about the individual and although Jr may be glad while he at college that he has that card for emergencies it is doing nothing to build his credit. That is why so many 18-20 year olds are still turning to student credit cards in an attempt not only to have a source of financial help on hand but to build their credit rating too. The rules for student credit cards have changed after the Credit Act of 2009 was put in place but most of those changes did relate to the way these cards were promoted, not the actual structure of the student credit cards system itself. Once your teen passes their 18th birthday they can apply for a student credit card. They can also apply for a “regular” credit card but the chances that they will be accepted for one are slimmer. However teens need to be very careful. Parents should encourage teens to only take a credit card with a low limit – maybe $500 at the max – and only to use for emergencies and essentials – not to fund a lifestyle that they simply cannot afford. Some of the best student credit cards include the State Farm Student credit card because it has a relatively low APR of 11.24% and the Citi Dividend Platinum Select Visa Card for College Students which not only has a low APR of 12.90% but a rewards program as well that is a little extra added bonus.